Transmitted precisely 30 years ago, the BBC television version of the Charles Dicken's classic ghost story, made in 1977, seemed an appropriate archive item to mark the Christmas period and to take an opportunity to say 'Merry Christmas' to all the visitors to this blog. Published in 1843, the hugely successful novella is adapted here into a very lean but faithful version of the story by Elaine Morgan. Nothing is added and no attempt is made to contemporise any of the existing elements so you could approach this as being one of the most traditional versions ever made. It's so steeped in tradition that it even uses the original John Leech illustrations to compose some of the backgrounds. But don't let that put you off. Despite a short running time and slightly rushed conclusion, this is a quintessential slice of Seventies television. Many viewers might snigger at the now seemingly low-tech production but for me there is much virtue in its all studio production. The sets are minimalistic and often dissolve wonderfully into and out of Leech's drawings, the lighting is very clever in the way it silhouettes and back-lights the main characters and most exciting of all is the use of deep focus, overlay and in vision video effects. Images are piled on top of one another, giving the main characters an impressionistic and transparent quality that befits the nature of the ghost story. There is a giddy, floating and dissolving of faces and backgrounds that shows off director Moira Armstrong's strong visual style and she has an ability to inlay illustrations, effects, objects and people electronically into the picture that is an addition to the atmosphere rather than a distracting one. 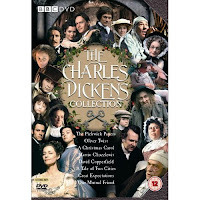 Much of Dickens original dialogue remains and the main cast seize the script and play it for all its worth. Michael Hordern is stunning as Scrooge and his journey is mapped out in a complex performance that takes us from the initial cruelty of the character to his final, abundant redemption. His playing considers the medium and it isn't overblown as so many Scrooges can be but rather he capitalises on a subtle use of facial movements and physicality to convey the repressed nature of the man. It isn't a sentimental portrayal at all but his re-emergence into society is heart-felt. All the other performances gravitate towards Hordern's and there are some fine supporting turns from John Le Mesurier as Jacob Marley, Patricia Quinn as the Ghost Of Christmas Past and Bernard Lee as the Ghost Of Christmas Future. Mesurier captures the utter melancholic depression of Marley's existence in purgatory and his sense of remorse also dominates the performance. Quinn and Lee cut bizarre figures and although effective they don't get an awful lot of screen time and Lee in particular just about manages to get Dickens central message about poverty across before the story moves on. Quinn is particularly good where she gets to contrast Scrooge's curmudgeonly nature with sequences from his youth in order to instill in him doubt and remorse about his current nature. Dickens original message is delivered without bombast, hyped up effects and acting. The production is stripped back and might now be considered rather thin but I see it as a fine example of televisual craft where studio based, multi-camera dramas provide an immediacy that is often lacking in big budget film versions of the story. Where they have gloss this has an hallucinatory brevity and deft performances to make it a classic piece of television.